Weekly Roundup 3-30-15: Music, Easter eggs and a Transit Conference – Peninsula Moves! Switchboard Music Festival Offers Diverse Range of Sounds: Touted as eight hours of eclectic and innovative music offerings, the 3rd annual Switchboard Music Festival will take place this Saturday in San Francisco. The event, which begins at 2 p.m., features jazz, classical, rock, world and avant-garde offerings, the Switchboard Music Festival highlights independent and local Bay Area artists. The highlight of the night will be a 53-person interpretation of Terry Riley’s “In C,” a complex musical composition intended for large performing groups. Taking place at the Brava Theater, in San Francisco’s Mission District, Switchboard Music Festival is easily accessible by BART and Muni, and is about a 1-mile walk from Caltrain’s 22nd Street Station. Easter Eggstravaganza in San Mateo: It wouldn’t be Easter without an egg hunt, and the Bay Area has plenty of those to offer this weekend. 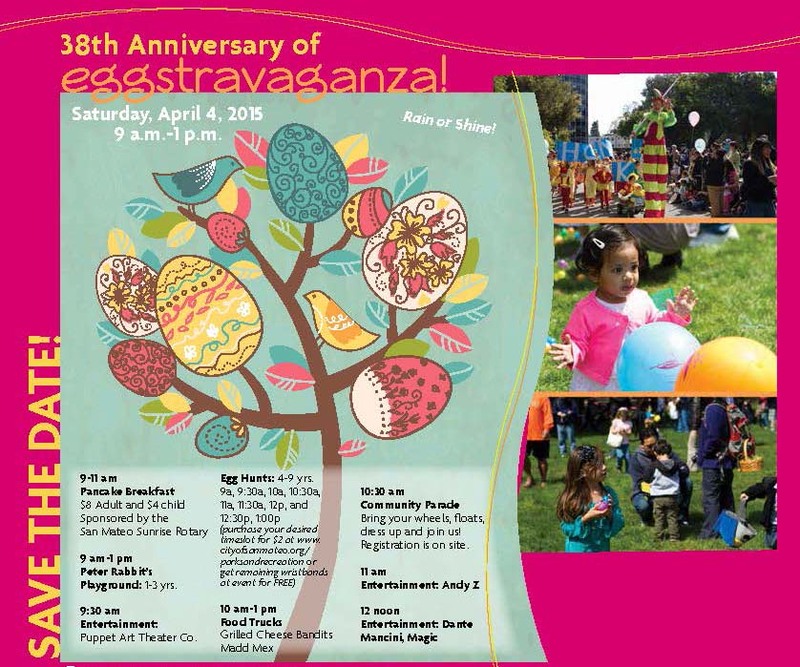 San Mateo is hosting its 38th annual Eggstravaganza on Saturday morning at Central Park. Starting at 9 a.m., the event will have a pancake breakfast, food trucks, a community parade and separate egg hunt for little kiddiez (1 – 3 years old) and older tykes (4 – 9 years old.) There will also be free entertainment all night long, from magicians, puppeteers and other children’s performers. Located adjacent to El Camino Real, Central Park can be reached by several different SamTrans lines, including the Route ECR which offers service every 20 minutes on Saturdays. Empowering Bay Area Transit Conference: The Commonwealth Club in San Francisco will host a free morning seminar on Tuesday focusing on improving the Bay Area’s regional public transportation network. Topics will include transportation integration, the role of governance in transit and industry best practices. Sponsored by the Mineta Transportation Institute and the Eno Center for Transportation, among others, the seminar will feature speakers like State Senator Jim Beall, the chair of the California Senate Transportation Committee, and a panel discussion comprised of the heads of BART, the San Francisco Municipal Transportation Agency and other local leaders.